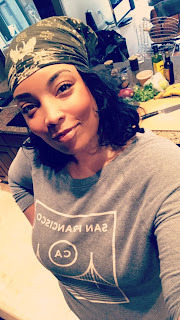 This blog post was sponsored by Sweet Baby Ray’s, but the opinions are all my own. We have finally made it out of the winter season and into spring! I don’t know about you, but I’m a little tired of dragging out my heavy pots and slow cookers. It’s a great time of year to get out of the kitchen and take advantage of perfect outdoor cooking weather. 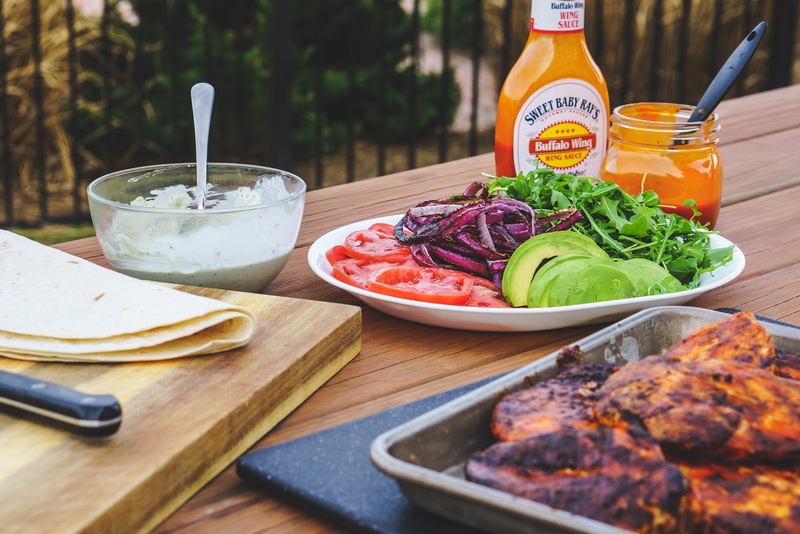 I’m excited to share an easy recipe for spicy, saucy, grilled chicken wraps featuring Sweet Baby Ray’s Buffalo Wing Sauce! 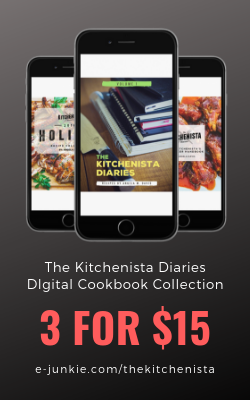 The recipe is broken down into three major steps, starting with a buttermilk brine to tenderize and season this lean cut of chicken. Buttermilk is one of my favorite grilling marinades because it helps keep the meat moist as it cooks and creates a crusty charred surface. 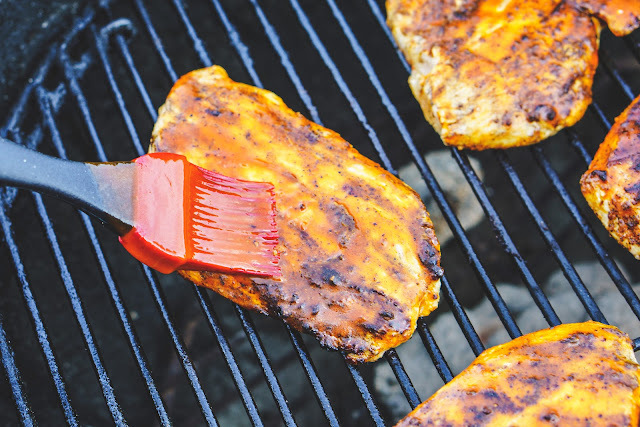 The marinated chicken breasts are then grilled over high heat, which can be done on a gas or charcoal grill. Halfway through the grilling process they are slathered with plenty of buffalo sauce, which was a fun change from barbecue sauce for grilled chicken. Finally, the wraps are assembled with chopped grilled chicken and all the fixings. I think a homemade blue cheese or ranch dressing really sets everything off but feel free to use your favorite and most convenient condiments here. After all, the idea is to get out of the kitchen for an afternoon and enjoy this amazing season! 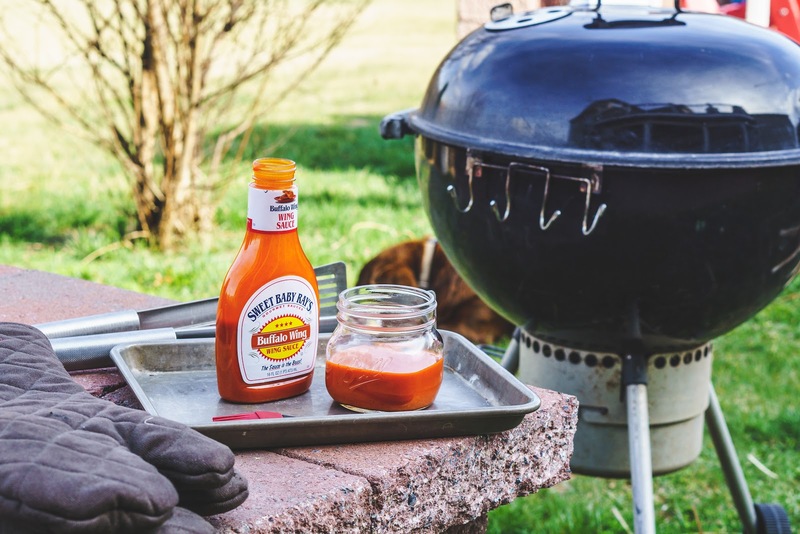 You can grab the step by step recipe below, and be sure to pick up a bottle of Sweet Baby Ray’s Buffalo Wing Sauce at your local grocery store. 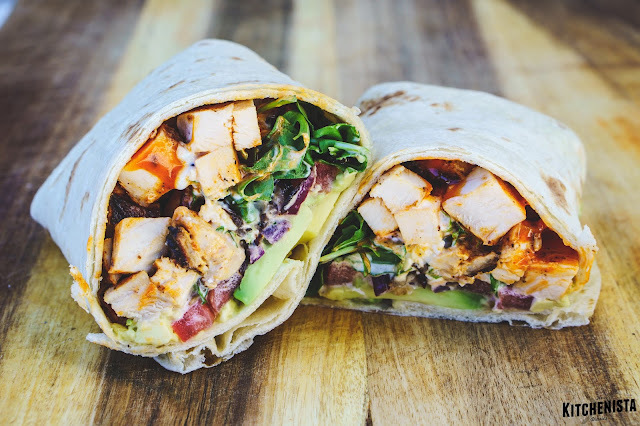 I'm happy to share that my Buffalo Grilled Chicken Wraps are also posted on Sweet Baby's Ray website as part of their recipe collection! In a large bowl, whisk ¼ cup Kosher salt into the buttermilk until dissolved; set aside. Pound the chicken breasts out to about ½” thickness; this will ensure even and quick cooking on the grill. To do this, place a few chicken breasts at a time between plastic wrap or a plastic storage bag. Use a meat pounder or rolling pin to flatten out the thick part of the cutlet. 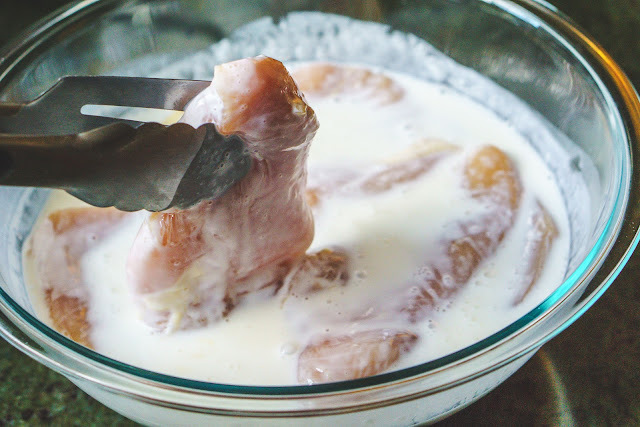 Add the chicken breasts to the buttermilk brine so that all the chicken is submerged. Refrigerate for at least an hour and up to 4 hours. After brining, remove the chicken and pat dry. Mix together the paprika, pepper, garlic and onion powders. 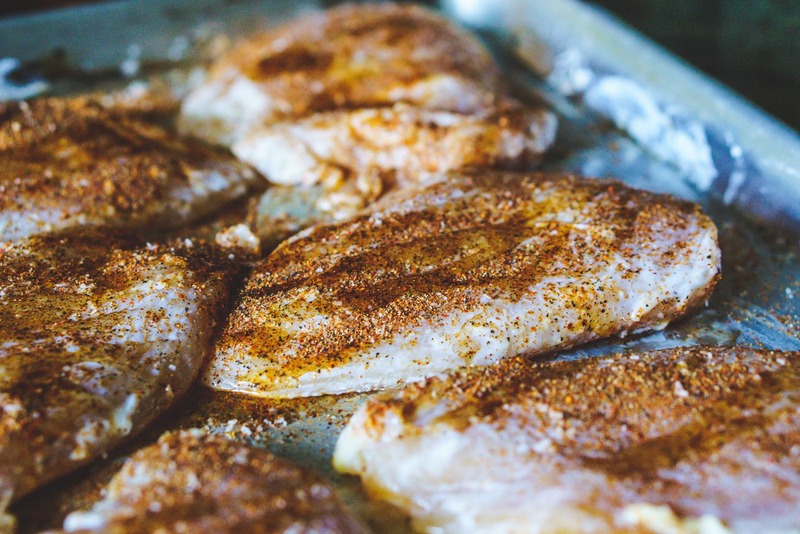 Drizzle the chicken with oil to lightly coat and season both sides of the chicken with the spice mix. 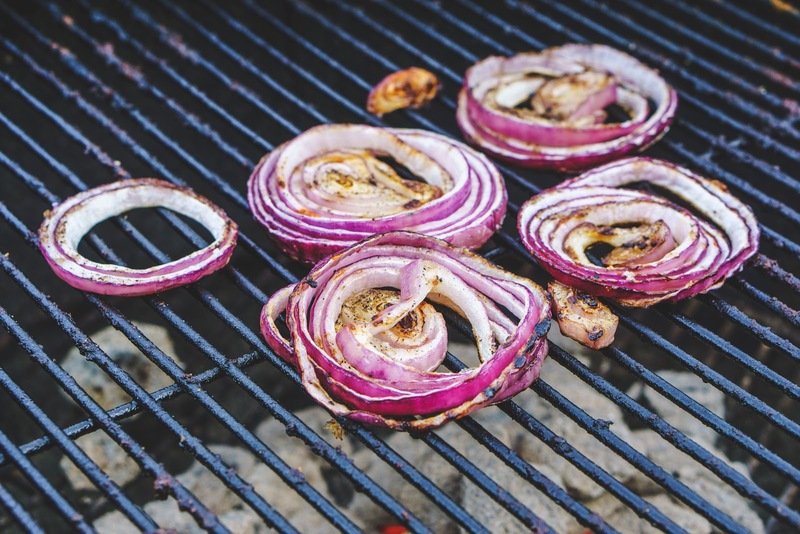 Prepare a charcoal or gas grill for direct heat; approximately 400°F to 450°F. 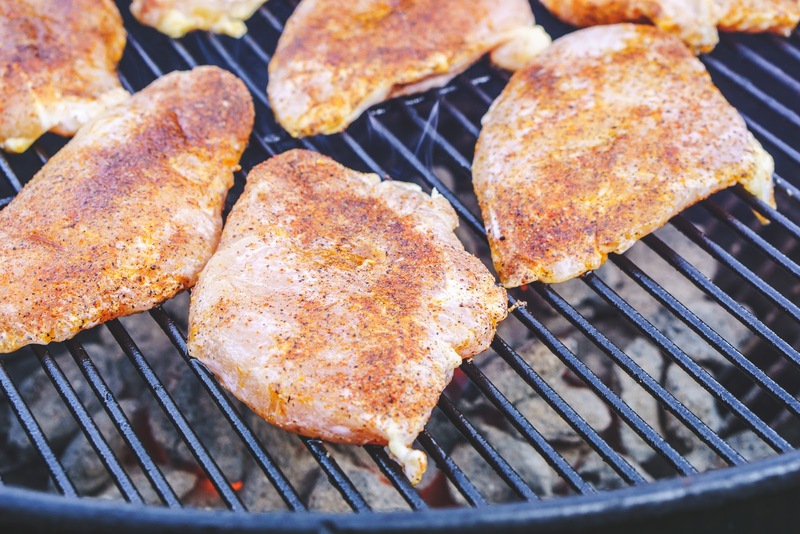 Once the grill temperature has stabilized, oil the grates. Arrange chicken breasts in a single layer over the hottest area of the grill to sear on one side. After a couple minutes, flip the chicken over to sear the other side. If you’d like, you can also grill the sliced red onions for your wraps during this time! Pour a cup of Sweet Baby Ray’s Buffalo Wing Sauce into a small dish. Baste the chicken with a light layer of sauce. Flip the chicken over and baste the other side with buffalo sauce. Continue flipping and basting every minute until the chicken has cooked through and registers 155°F on an instant read meat thermometer. 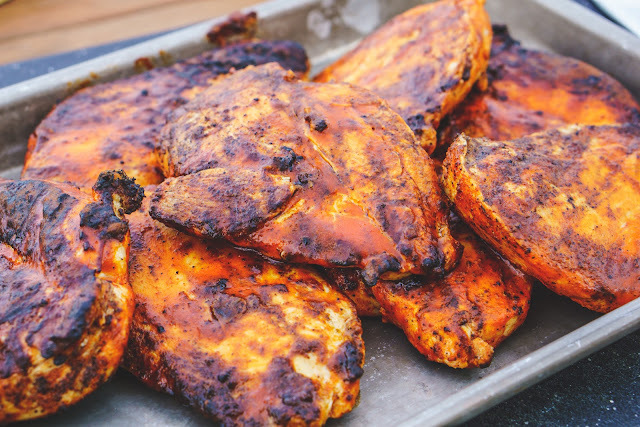 Transfer grilled chicken to a platter and allow to rest for at least 5 minutes before slicing. Its temperature will continue to climb up slightly so it’s important not to overcook it on the grill. To assemble, you’ll need about a half cup of chicken for each wrap. Leftover chicken can be refrigerated and eaten within 2 to 3 days. Wraps are easier to handle if warmed for about 10 seconds in the microwave, optionally. 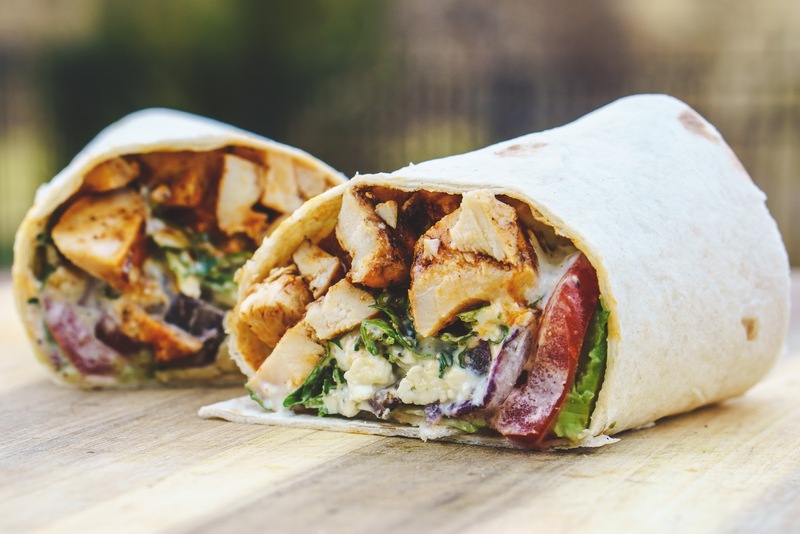 Place a small mound of chopped grilled chicken on the lower 1/3 of a wrap. 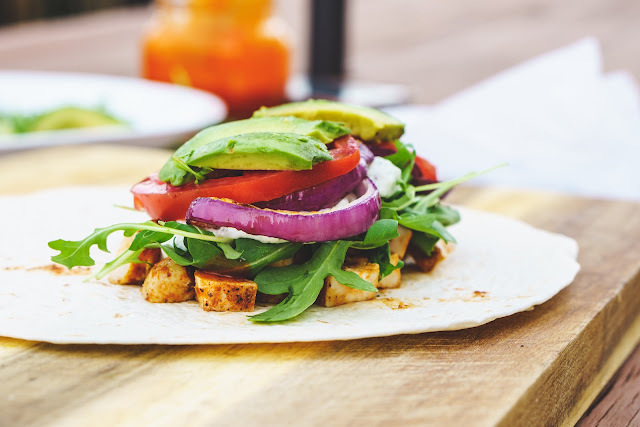 Top with additional buffalo sauce, lettuce, tomato slices, avocado slices and your choice of salad dressing. Fold the sides of the wrap towards the center while rolling from the bottom up. Continue rolling and tucking the contents of the wrap in as you go, until the wrap is closed. Slice in half as desired and serve immediately. This was really good and easy to make. I don't have a grill so I cooked them in a cast iron skillet. These wraps were amazing.